Offering you good value. The Quality Classic Laurel Medal is elaborately embossed with a detailed classical laurel leaf design and has a blank centre for you to include your logo. Alternatively, you can choose from our huge stock collection of FREE printed insert images. Embossed with detailed angular grooves, the Quality Diamond Medal is embossed to a high standard and offers you excellent value. There is a blank centre for you to include your logo. Alternatively, you can choose from our huge stock collection of FREE printed insert images. Great value, an all-in-one combination. The medal is supplied with a FREE red, white and blue ribbon. 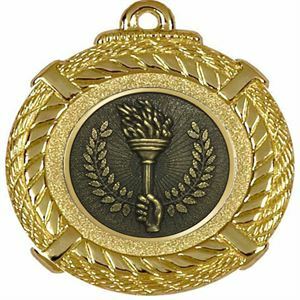 The medal has an embossed decorative border and a laurel wreath surrounding the centre. 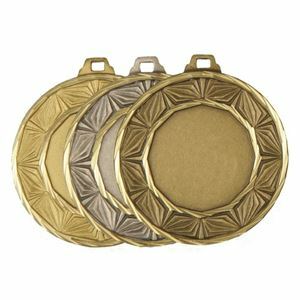 Cast in metal with an antique bronze finish, the Combo Insert Medal & Ribbon has a blank centre which you can personalise with your team or club logo. Alternatively, you can choose from our huge stock collection of FREE printed insert images. This glossy Tudor Rose Medal features modern styling with two different metallic textures. 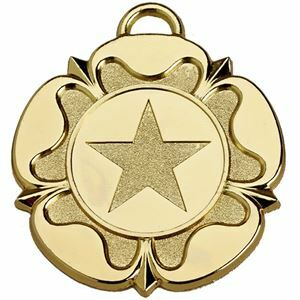 Finished in a choice of three glazes; gold, silver or bronze, this medal is decorated with a star motif centre which can either be left blank or a self adhesive insert can be applied over it. The floral design of this medal replicates a stylised rose and is formed from lacquered metal. 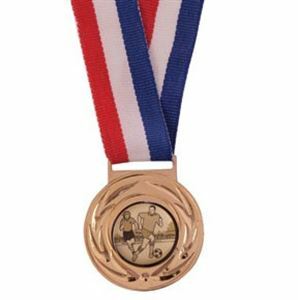 Supplied in three finishes; gold, silver and bronze, this medal comes with a central disc onto which a printed logo insert can be applied to create a bespoke medal suitable for any medal requirement. The Denver Medal has been cast from a shiny glazed metal and features a wide band of embossed laurel leaf design. 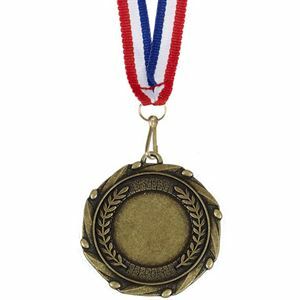 The medal is supplied in a choice of three colours; gold, silver and bronze and would be perfect for any award giving event. The medal can also be personalised with a self adhesive logo insert in the centre, creating a truly bespoke medal. Showcasing nautical styling with a rope effect border, this Portland Medal features a central disc which allows you to include your club or team logo. Alternatively, you can choose from our huge stock collection of FREE printed insert images. 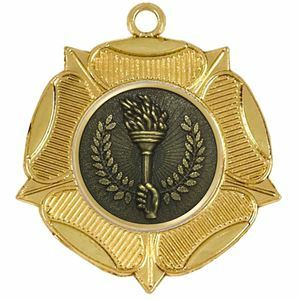 Forged from metal, this medal comes in gold, silver or bronze and has been glazed to create a high shine finish. The Phoenix Medal displays ornate embossed decoration comprising a faceted effect rim and a border of a laurel wreath and scroll. 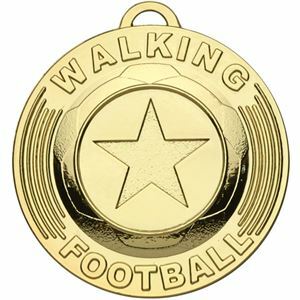 This high shine medal is available in three colour options and features a central disc, onto which a self adhesive insert can be applied. Excellent Value. The Value Medal & Chunky Ribbon offers an all-in-one combination and great price, making this a great choice when rewarding a whole team or class. The medal is cast from high quality zinc alloy and is supplied with a chunky (22cm wide) red, white and blue ribbon. 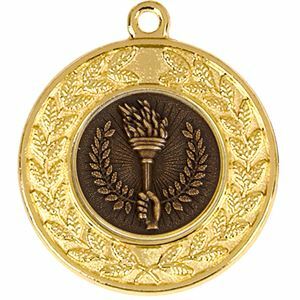 The medal is embossed with a laurel wreath and has a blank circular centre which allows you to include your club or team logo. Alternatively, you can choose from our huge stock collection of FREE printed insert images. With blue enamel detailing to the laurel wreath, the Quality Blue Enamelled Laurel Medal has an embossed blue laurel wreath on a backdrop of fine grooving. 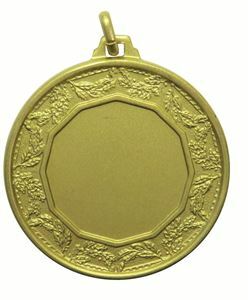 This medal has a blank centre for you to include your club or team logo. Alternatively, you can choose from our huge stock collection of FREE printed insert images.